There are, however, a couple rare sites that I do have the desire to change. The main culprit being Google. More specifically, Google is too white (no that's not racist.) 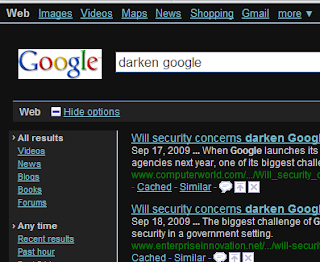 Luckily, I can darken Google (that is, _real_ Google, not the Google Dark site. Mostly because if I want to use Google's new search sandbox, Caffeine, the customized Google frontends can't do that. You can find more information on customizing FireFox here and here. Update: This is no longer strictly necessary now that Google's Caffiene sandbox has been rolled into their normal search results. However, it is still a good demonstration of custom styling via usercontent.css. Cache debugging: Page was rendered Apr 21, 05:14:33.